The common witness of the church is public, because God calls the church to engage in the public space. “The common witness of the church is public, because God calls the church to engage in the public space,” says Jackelén. She recommended the document “The Church in the Public Space”, adopted by the LWF in 2016 to follow up on this. Quoting the “ABCDE of the Church’s Engagement in the Public Space” from this document she pointed out that churches should assess public issues in participatory ways, build relationships of trust, challenge injustice, discover signs of hope and empower people in need. This was especially important for Christians in a minority context. Jackelén identified “the lack of a credible hope” as the underlying cause of four dangers of our time: polarization, populism, protectionism (often manifested as nationalism) and post-truth. She then described the “what” and the “how” of witnessing by presenting one driven by “divine dissatisfaction” and one driven by “divine surprise”. Martin Luther King, she is convinced, is a witness “driven by divine dissatisfaction”. The black community in the USA looked to the black church not only for spiritual nourishment in hymns and prayers, but also for leadership and social and political support. It was in need of witness that is holistic and public. A “witness driven by divine surprise” she found in the figure of “Miss Cleopas” whom she saw depicted in an Ethiopian icon of the Biblical story of Emmaus. The person accompanying Cleopas on the way to Emmaus being a “person from his house” it might have been his wife, Jackelén argued. “May God bless our witnessing with humility and of speaking candidly, with good courage to speak and excellent listening skills! For the sake of healing,” she concluded her address to the CEC General Assembly. The CEC General Assembly took place in Novi Sad, Serbia, from 31 May to 6 June 2018. 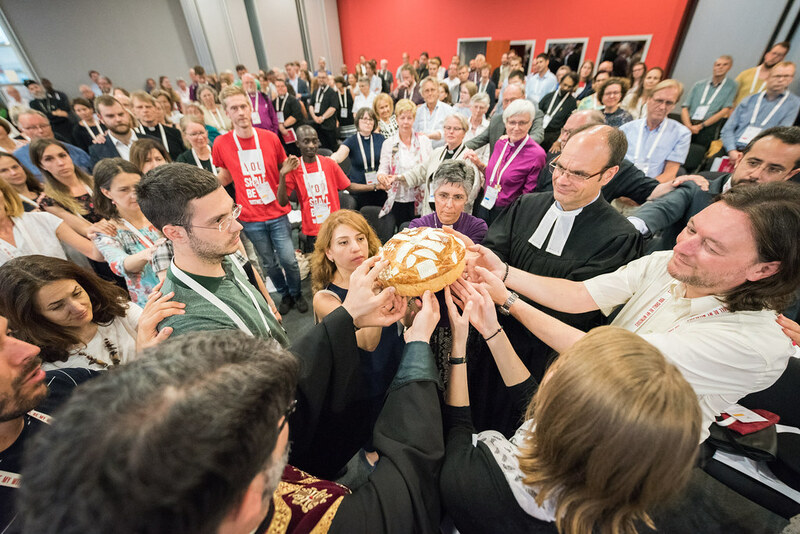 Around 500 delegates and guests from various confessions across Europe – Lutheran, Reformed, United, Orthodox, Anglican, Methodist, Baptist and others – met under the Assembly theme “You shall be my witnesses” (Acts 1:8) with its three sub-themes “Hospitality”, “Justice” and “Witness”.